Born 1748 to a life of luxury, Anne Conway was subjected to an arranged marriage, in 1767, to a husband she neither knew nor liked. 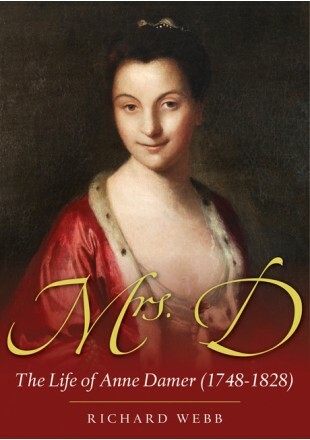 Without him, she enjoyed the high life and with Georgiana Duchess of Devonshire became one of the It girls of swinging London 1775. 1776 brought abrupt change. As the age of revolution gathered pace, Anne's husband John Damer went bankrupt, and committed suicide. Anne turned to sculpting. She modelled friends and family, their animals, and public heroes including Admiral Nelson. Living through a further half century of revolution, she mixed sculpture, with acting, writing, and travel. Her friends included leading members of the political, arts and theatre world. Her descriptions of people, travel and life in differing countries of revolutionary Europe are fascinating. Nelson gave her his coat, Napoleon, a diamond encrusted portrait of himself. She formed a triangular friendship with her godfather Horace Walpole and his protegee Mary Berry. Mrs D is the abbreviation by which Anne Damer is frequently described in their letters to each other. Horace left Anne his famous house, Strawberry Hill in Twickenham, and gave Mary and her family the house next door. Richard Webb was born and brought up in rural Worcestershire. After school at Harrow, he secured a degree in modern history at Oxford University, and a post graduate diploma in business administration at the LSE. His subsequent working life was occupied in running the family owned Garden Centre, Webbs of Wychbold. He was elected to the Council of the Royal Horticultural Society on which he served for 10 years. He has written numerous gardening articles, and a book of verses 'Webbs Seed Corn'. He is married to Marigold, great great great granddaughter of Louisa Johnston, Anne Damer's niece, to whom the sculptress left the bulk of her estate. They have two children, Ed who now runs the garden centre, and Kate (Holland) who binds designer books with flair, and six grandchildren.